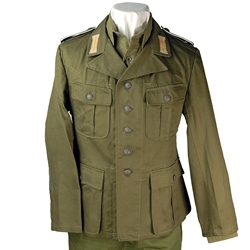 Reproduction of the first model German Heer WWII Tropical Tunic. Excellent quality cotton twill fabric in olive green color. Piping colors may vary, sorry no choice. The Tropical Tunic features pleated pockets with scalloped flaps, cotton twill, split cuffs, shoulder board loops and pebble finish buttons. U.S. Sizes: 40, 42, 44, 46, 48, 50. Insignia and other items sold separately. I'm extremely pleased with the high quality and detailed attention to this tunic for the price. Mine came with the shoulder boards, litzen on the collar, and an Afrikakorps cuff band beautifully sewn in place. I normally wear a size 44 chest, but the 46 fit very well. Lindy and her team are the best. The most responsive customer service I've had online ever! This tunic is absolutely fantastic copy of the original in every way. Color, cut and stitching are masterful. I took a chest measurment and ordered a tunic 2 inches larger and it fits perfectly! I would recomend this product to everyone interested.